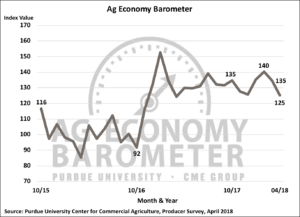 The Purdue/CME Group Ag Economy Barometer fell to 125 in April, which was 10 points lower than a month earlier and 15 points below its February reading (Figure 1). The sharp drop in the ag producer sentiment index, which is based upon a monthly a survey of 400 agricultural producers from across the U.S., was attributable to producers’ weakening perceptions of current conditions in the production agriculture sector, along with a decline in their expectations for future economic conditions. The Index of Current Conditions fell to 123, 11 points lower than in March, and the Index of Future Expectations declined 9 points to 126 (Figure 2). 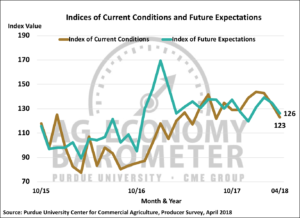 Both the Ag Economy Barometer and the Index of Future Expectations hit their lowest readings since March 2017 and the Index of Current Conditions was at its lowest level since May 2017. Figure 1. Purdue/CME Group Ag Economy Barometer, October 2015-April 2018. Figure 2. Indices of Current Conditions and Future Expectations, October 2015-April 2018. The undercurrent of concern expressed by producers in March became more pronounced in April as the trade dispute with key export customer China continued. For example, compared to February of this year, producers in April were more negative about future agricultural export prospects. In February 2018, when asked to look ahead 5 years, 13 percent of producers said they expected agricultural exports to decline. When the same question was posed in April, the share of producers expecting lower exports increased to 17 percent. Producers’ perspectives regarding crop prices deteriorated markedly compared to earlier in the year. The impact was most pronounced in soybeans. Soybean prices are particularly vulnerable to disruptions in trade with China, as China’s share of U.S. soybean exports is approximately 30 percent. The share of producers expecting soybean prices to decline in the year ahead rose to 27 percent in April compared to just 15 percent who said they expected prices to decline when the same question was posed back in January (Figure 3). Moreover, when producers were asked about the likelihood of November 2018 CBOT soybean futures trading below $9.50 per bushel between April and fall 2018, over half (53 percent) of producers said they expected the fall futures contract to fall below $9.50, representing a decline of over $0.75 per bushel from where the contract was trading during the survey period. A decline of that magnitude would push soybean prices below many producers’ breakeven price level. The shift in attitude extended beyond crops into animal agriculture. Each month producers are asked whether widespread good times or bad times are more likely for crops and livestock, respectively, in the upcoming five years. Responses to the April survey revealed the largest one-month decline in the percentage of producers expecting good times for livestock producers since data collection began in fall 2015. When this question was posed in March, 59 percent of the respondents said they expected good times for livestock production, but in April this dropped to 45 percent, a one-month shift of 14 percent. These concerns were particularly noticeable when producers were queried regarding future U.S. pork production. In March, 70 percent of survey respondents said they expected the U.S. hog inventory to increase in the year ahead and 30 percent said they expected the hog inventory to contract. But when the same question was posed in April, only 52 percent said they expected the U.S. hog herd to increase and 48 percent said they expected contraction to take place. The sharp decline in hog prices that took place from mid- to late-winter apparently eroded producers’ confidence in future expansion plans. For example, barrow and gilt prices in the Iowa-S. Minnesota market declined 36 percent from their mid-winter peak to their early April low. Although prices recovered somewhat by the third week of April when the survey was conducted, they were still 24 percent lower than their February peak. The weakness in pork prices was reinforced by concerns regarding the impact of China’s imposition of a 25 percent tariff on U.S. pork imports. Despite the increase in negativity expressed by producers regarding the outlook for the next 12 months, producers’ long-run perspectives with respect to large farm investments and used farm machinery values did not change appreciably compared to a month earlier. 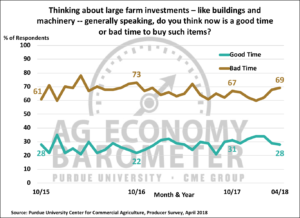 In March, 29 percent of respondents said it was a good time to make large farm investments and 68 percent of respondents felt it was bad time for large investments (Figure 3). Responses to the same question in April were only slightly more negative as 28 percent felt it was a good time for large investments and 69 percent said it was a bad time. 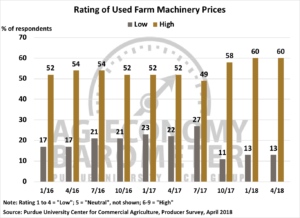 When producers were asked to evaluate used farm machinery prices, 60 percent rated prices as high and 13 percent rated them as low, both unchanged from the March survey. Figure 3. Large Farm Investments, Is Now a Good Time or a Bad Time to Buy Such Items?, October 2015-April 2018. Figure 4. Rating of Used Farm Machinery Prices, January 2016-April 2018. Producers’ perspectives regarding farmland values did shift downward on the April survey compared to February. In February, 22 percent of producers expected farmland values to increase over the next 12 months, but this percentage dipped to 18 on the April survey (Figure 5). The percentage of respondents expecting lower farmland values in the upcoming 12 months rose modestly to 18 percent on the April survey from 16 percent in February. There were also fewer producers expecting an increase in farmland values 5 years from now in April than back in February. In February, 53 percent of respondents expected higher farmland values 5 years ahead, but in April this declined to 46 percent. Figure 5. Farmland Price Expectations, 5 Years from Now, May 2017-April 2018. U.S. producers expressed an increase in concern compared to a month earlier about future ag exports, with 17 percent of producers indicating they expect exports to decline over the next 5 years. The negative perspective regarding exports appeared to spill over into concerns about commodity prices, especially soybeans, as the percentage of producers expecting lower soybean prices in the year ahead nearly doubled from 15 percent in January to 27 percent in April. Producers were more pessimistic about future returns for livestock producers than they were earlier in the year and the percentage of producers expecting pork industry expansion in the year ahead declined from 70 percent in March to 52 percent in April. 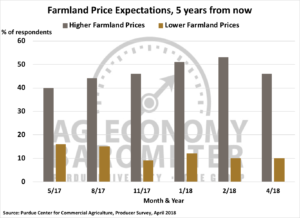 Concerns about commodity prices appeared to have some spillover impact on producers’ views of farmland prices, as the percentage of producers expecting farmland values to increase over the next 5 years declined from 53 percent in February to 46 percent in April. Despite the shift toward a less optimistic outlook, however, producers’ perspectives on used farm machinery values and on whether now is a good time to make large farm investments changed very little from a month earlier.